The Stained Glass Windows of Zion Ev. Lutheran Church! Financial Secretary: The position of Financial Secretary remains open. If you would be interested in offering your services, or know of anyone that might be interested, please contact the office for details (412-264-6420). Financial Secretary is an appointed position and does not require membership of Congregation Council. Anyone interested in providing altar flowers or sponsoring a bulletin, please be sure to see the Sign-up Binders located in the Narthex. The cost for altar flowers is $40 and cost to sponsor a bulletin is $10. 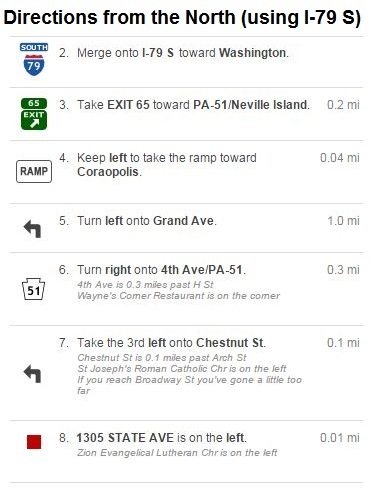 Most of the on-street parking is on Chestnut St. (along the side of the church) and on 5th Ave. (below the church). There is some on-street parking on State Ave. (above the church). The stained-glass windows of our church are all originals, in the sense that no effort was made on the part of the artist to copy the Masters. The windows give soft light and, at the same time, give expression of our faith. The subjects were chosen by The Reverend Fred L. Poulson (Pastor of Zion from 1929-1958) who spent many hours with the artists as the work was being done at the studios. Construction on this new part of the church was begun in 1951 and dedicated in 1954. The architect at the time was Arthur N. Steinmark, of Pittsburgh. Beginning at the organ side of the church is the Nativity window. The central portion of the window carries the Nativity scene with Mary, Joseph, and the Baby Jesus. The related emblems give expression to the Conception in the Lily, and the precious gifts of the Wise Men who came to worship Jesus. The Boy Jesus is the temple scene where the 12-year-old Jesus appeared. The related emblems speak of the temple scroll, and the seven-branched candlestick signifying the light of knowledge and learning. This window carries the Baptism of Jesus at the Jordan River by John the Baptist. The association of this scene is the statement of John calling Jesus the "Lamb of God", and the incident of the temptation immediately after the baptism. This window could not be treated with stained glass as the masonry supports the church tower. Therefore, the building committee chose to place memorial plaques as a tribute to those of us who, under God, were enabled to build the church. The Good Shepherd is the subject of the great window which graces the top front of the church building. The slender figure of the Good Shepherd with a sheep and a lamb is surrounded by the seven so-called cardinal graces in accordance with Matthew 25: "Feed the hungry, clothe the naked, shelter the stranger, visit the sick, care for the widows and fatherless, bury the dead, and help the prisoner." The ventilator openings carry the Apostolic graces of FAITH, HOPE, and LOVE. The Upper Room opens the scenes of our Lord’s nearness to the cross. The central figure speaks of the Institution of the Lord’s Supper, and is supported by the basin and towel (Jesus washed the feet of the disciples) and the wheat and grapes which speak of the bread and wine. The Gethsemane window presents the Agony of the Garden Prayer with the appearance of a mysterious cup, which could not pass. In back of the figure of Jesus is the garden scene with the three sleeping disciples. The side emblems depict the Dark Hour and crown of thorns, and the arrest at The Garden Gate. This window shows the figure of Christ on the Cross, the women at the foot of the Cross, and the Latin inscription "I.N.R.I. ", written by Pilate and nailed at the top of the cross. This means KING OF THE JEWS. The emblems are the hammer, nails, sponge, and empty cross (signifying burial). The Resurrection centers with the recognition of the risen Lord by Mary who would have fallen to embrace His feet. The emblems point to the earthquake, the palms, and crown of victory. CHRIST IS RISEN...ALLELUIA! The Baptistry is graced with a beautiful small window of precious glass portraying Christ blessing the children. The delicate tints of imported color glass make this a moving window from every angle. The inscription reads, "AND HE PUT HIS HANDS UPON THEM AND BLESSED THEM." These windows portray the names and symbols of the twelve disciples in the order of Acts 1:13. The tinted glass is very delicate and admits light to see into the Nave. The Narthex front windows carry the names and symbols of the four Gospel saints: Matthew, Mark, Luke, and John. A small window in the stairway leading down to Poulson Hall points to a ship. This is the ancient symbol of the Church. The upper front windows off the balcony stairways speak of prayer and praise. The round stone window facing Chestnut Street (balcony stairway) has the beautiful color design of Luther’s Coat of Arms (see back cover). On the other side of the church (balcony stairway) you will see Luther’s Battle Hymn window, “A Mighty Fortress Is Our God”. Within the room next to Luther’s Battle Hymn, two small windows point to the Law and the Gospel. 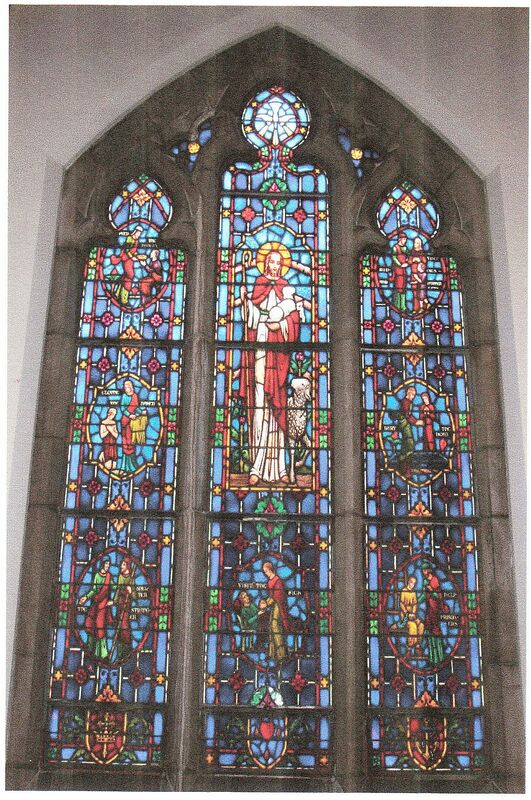 We, Zion Evangelical Lutheran Church of Coraopolis, Pennsylvania, are proud of our windows. In daylight, they speak with purpose and spirit to all who come to worship. At night, the lighted church gives a friendly and warm invitation from our Savior to all who pass along our streets. 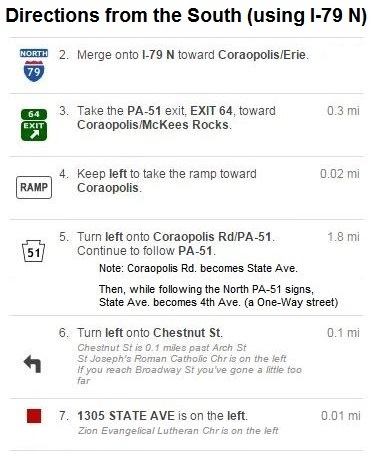 1895 December 22 - The first Lutheran Worship Service was held in Coraopolis by The Reverend O.S. Oglesby in the old Presbyterian Church on Fifth Avenue. 1896 October 6 - The accepted birthday of Zion Evangelical Lutheran Church. Seventeen persons gathered at the home of Martha Stoehr and adopted a Constitution. 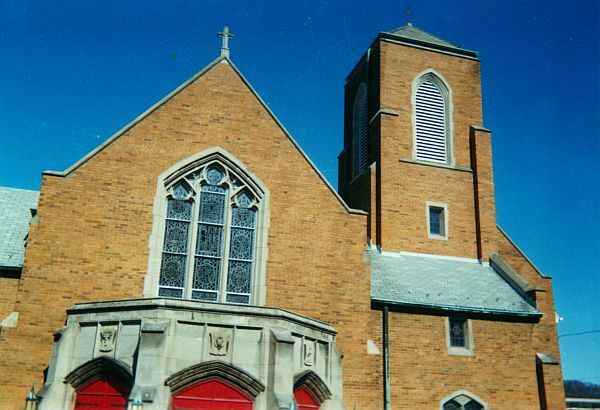 For the next two years, services were held in Scharpf’s Hall on Mill Street during the winter months and in the old Presbyterian Church during the summer months. 1896 The Reverend O. S. Oglesby was called for $60.00 a year. 1896 The lot on the corner of Fifth Avenue and Chestnut Street was purchased for $750.00. Two years later it was exchanged for the lot on the corner of State Avenue and Chestnut Street. 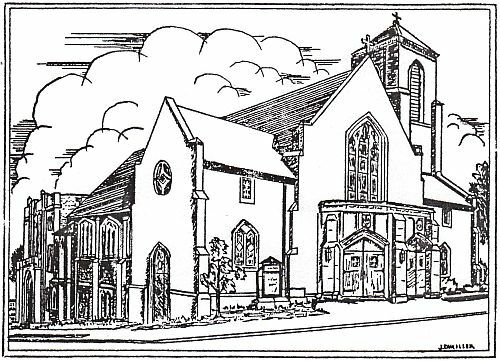 1897 January 8 - The first congregational meeting was held. 1897 Reverend Oglesby resigned because he could not preach in German. 1897 The Reverend S. W. Mautz was called. 1898 The church was united with the Mission at Canonsburg, Pennsylvania. 1899 The original Petition for Charter was filed in the Allegheny County Court of Common Pleas incorporating the name of Zion Evangelical Lutheran Church of Coraopolis, PA. The first church building was erected for $2,140.00. 1900 Separated from Canonsburg and became an independent parish. 1900 The Reverend S. W. Mautz founded the Mission in Wireton. 1901 Two members donated the church bell which is still being used. 1902 The Reverend Otto Mees was called. 1902 Luther League was formed and they supported students at Capital University. 1903 Alternate services in German and English. Zion became self-supporting. 1903 The Ladies Society was formed. 1906 The lot adjoining the church on State Avenue was purchased for $2,000.00. 1907 Zion united with the Joint Synod of Ohio. 1909 The parsonage was built on State Avenue for $5,500.00. 1912 Reverend Mees received a call to be President of Capital University. 1913 Reverend Mees became President of Capital University. 1913 The Reverend Ralph H. Long was called. 1913 The Deborah Missionary Society was organized. 1914 Zion Brotherhood was formed. 1916 Zion was closed by order of the State Department because of polio. 1918 Zion was closed by order of the State Department because of influenza. 1920 The congregation contributed $900.00 for the relief of brethren in Europe whose churches and homes had been devastated during World War One. 1921 German services were discontinued. 1921 The congregation gave an offering of $3,853.00 toward a million-dollar in-gathering for colleges, seminaries, and benevolent institutions. 1921 The Reverend George F. Hein was called. 1921 A Tellers-Kent organ was purchased and dedicated. 1929 The Reverend Fred L. Poulson was called. 1929 The Mary Martha Society was formed. 1929 The Sunday School building was dedicated. Cost to build was $50,000.00. 1944 The lot adjoining the parsonage (driveway) was purchased for $2,000.00. 1946 Zion’s 50th anniversary was celebrated. 1949 A financing program of Zion’s present church building began. Gifts and insured loans brought a total of $184,920.00 by the time the church was completed. 1951 There was a unanimous vote to enter into a contract for construction of the present church. 1952 Zion’s “Cornerstone” was laid on May 18. 1954 The 25th anniversary of the pastorate of The Reverend Fred L. Poulson was celebrated. 1954 Dedication of present church on October 10. Cost: $253,000.00. 1958 On November 24, The Reverend Fred L. Poulson passed away at the age of 64. 1960 The Reverend Glenn H. Oberdick was called. 1961 The Zion Lutheran Church Women (Z.L.C.W.) and women’s Circles were formed. 1964 A new parsonage was purchased at 1440 State Avenue for $25,000.00. The former parsonage was converted into the Pastor’s Study, Church Office, and Sunday School rooms. 1966 A Building Campaign contribution of $9,650.00 was sent to St. John Lutheran Home. 1968 The Bethel Series Adult Bible Study program began. 1969 The parsonage debt at 1440 State Avenue was paid in full. 1970 The 10th anniversary of The American Lutheran Church was celebrated. 1970 The 10th anniversary of the ordination and pastorate of Pastor Oberdick was celebrated. 1977 On September 18, the “Hymns for the Family of God” hymnal was used. 1981 The Reverend Glenn H. Oberdick resigns in November. 1981 The Reverend Ronald Rademacher served Zion as Interim Pastor in November. 1982 The Reverend John Hergert accepts the call to Zion. 1985 In February, the “Lutheran Book of Worship” (LBW) becomes Zion’s hymnal. 1985 In November, The Reverend John Hergert resigns and moves to Baltimore, MD. 1986 In June, The Reverend Gary Roth accepts the call to Zion. 1986 Zion pays the mortgage on the present church in full. 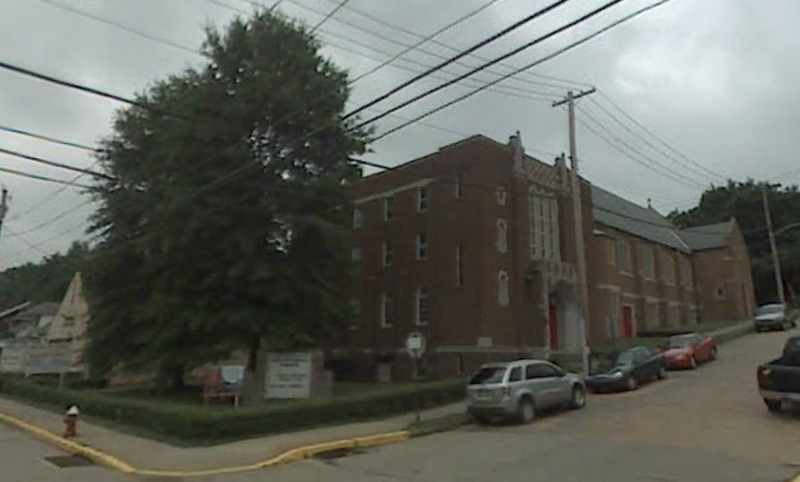 1990 The Lutheran Brotherhood, Ohio River Branch 8825, was formed. 1992 Zion begins to house the Neville Ark Food Pantry in February. 1993 The “Saturday Evening Song Worship” began at Zion in April. 1993 On November 21, the new Church Constitution is approved emphasizing mission. The voting age is lowered to 16 years of age. 1994 The Reverend Gary Roth preached his last sermon on Sunday, March 22. 1994 On November 20, the congregation votes to call an intern, Ken Shuman. 1995 “A Year of Celebration” began for the 100th anniversary of Zion. 1996 On May 26, the 100th anniversary was celebrated with a banquet. 1998 The Reverend Leonard Schulz was called as Interim Pastor. 1998 Larry Kemp, a son of the congregation, was ordained. 1999 The Reverend Steven Broome was called. 1999 Zion received $77,740.82 for the sale of the parsonage at 1440 State Avenue. 2003 The Reverend Steven Broome leaves Zion in October. 2003 The Reverend Robert Strobel begins as Interim Pastor in November. 2005 The Reverend Robert Strobel’s last Sunday to preach was April 30. 2005 The Reverend John Sweitzer began his pastorate at Zion in April. 2007 A new Allen Digital Computer Organ was installed on August 4 and dedicated on September 23. 2008 A new Handicap Restroom located off the Narthex was completed in January. 2008 The new Evangelical Lutheran Worship (ELW) hymnal was dedicated on June 13. 2008 New choir robes were dedicated on December 21. 2010 A ministry/memorial event of Reverend Fred L. Poulson took place on Sunday, June 13. Reverend Poulson served as Zion’s Pastor from 1929 until his death in 1958. The Fellowship Hall was then re-named Poulson Hall. A portrait of Reverend Poulson was unveiled by John Poulson and Jane Poulson Jackson. John, a great-nephew of Reverend Poulson, visited from St. Paul, Minnesota. Jane, a great-niece of Reverend Poulson, visited from Story City, Iowa. The portrait of Reverend Poulson is displayed in Poulson Hall. 2011 Zion celebrated its 115th birthday with a birthday cake and other light refreshments in Poulson Hall on Sunday, October 2, after Worship Service. Memorabilia was displayed for viewing. 2012 Zion celebrated its 116th birthday with a cake and other light refreshments in Poulson Hall on Sunday, October 28th, after Worship Service. This celebration was combined with Reformation Sunday. Church memorabilia, plus Reformation information, was displayed for viewing. 2013 The Reverend John Sweitzer resigned his pastorate at Zion, effective December 31. 2013 Our SWPA Synod (ELCA) supported Zion with supply pastors, effective January 6. 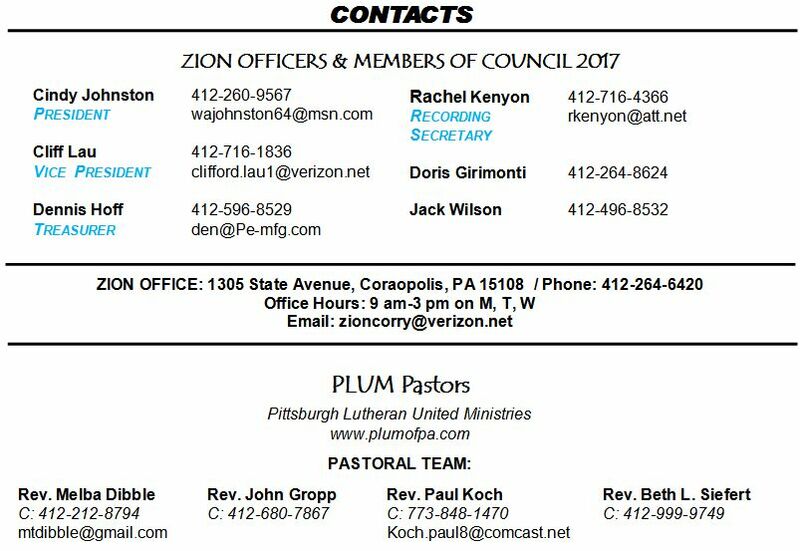 2013 The congregation of Zion voted to join the Pittsburgh Lutheran United Ministries (PLUM) on June 2nd. Zion became the 9th congregation united in this ministry. 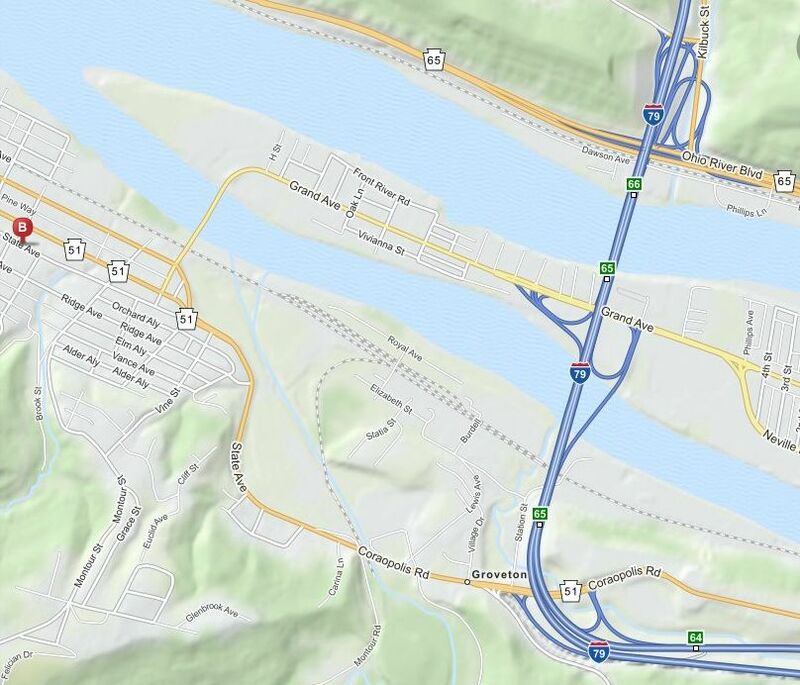 The PLUM headquarters is located in Duquesne, PA. The Pastoral Team consists of the Reverend John Gropp, The Reverend Beth Siefert, The Reverend Melba Dibble and The Reverend Paul Koch. 2013 Worship Service time was changed to 9:15 a.m., effective July 7. Sunday School will begin after the Worship Service. 1902 – 1912 The Reverend Otto Mees, D.D. 1913 – 1921 The Reverend Ralph H. Long, D.D. 2013 - Pastoral Team of “Pittsburgh Lutheran United Ministries”: Reverend John Gropp, The Reverend Beth Siefert, The Reverend Melba Dibble and The Reverend Paul Koch.